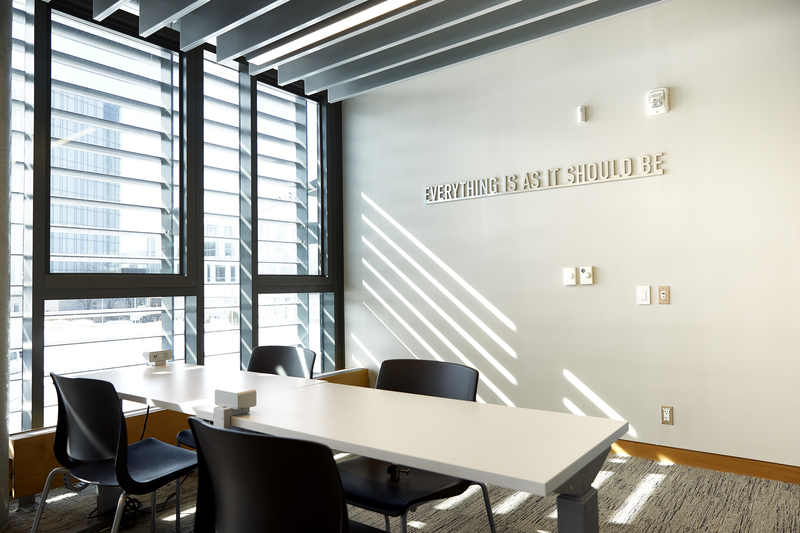 Located on the lower level of the new Rob and Cheryl McEwen Graduate Study & Research Building at York University’s Schulich School of Business, the aptly named Colleen Johnston and Brian Johnston Wellness Suite is a balm for all the harried students and faculty members who come there to destress, unwind and recharge. Wrapround murals of a forest in spring, a looping video of a twinkling pond and crepuscular lighting simulating twilight make the enclosed space seem like another world. 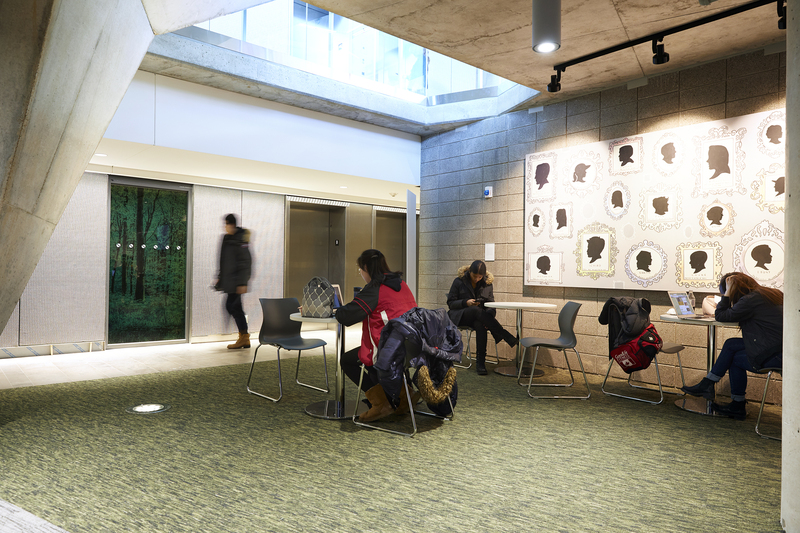 The design enhances well-being by drawing on nature to create an alternative experience of university life, making the people who use it feel at one with their environment. The entire building operates that way. 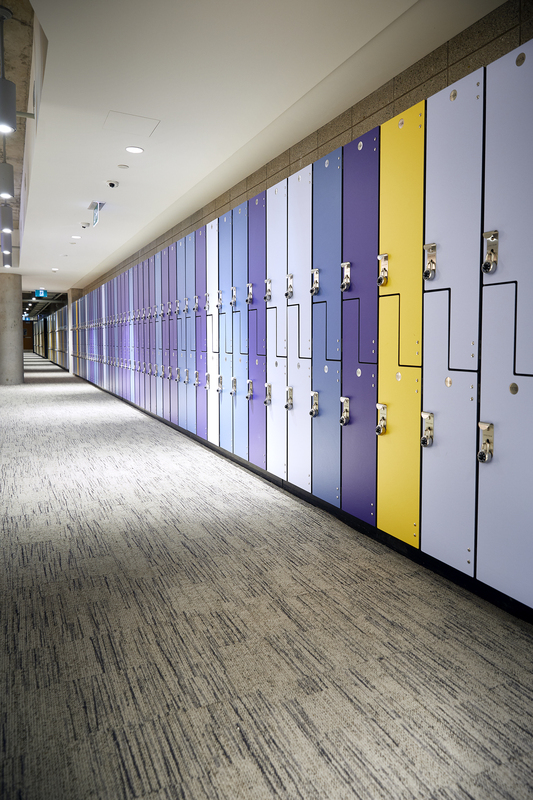 Officially opened to students this January and located on York Boulevard next to the Seymour Schulich Building at the entranceway of York’s Keele Campus, the McEwen Building boasts an architectural style that improves the quality of life. 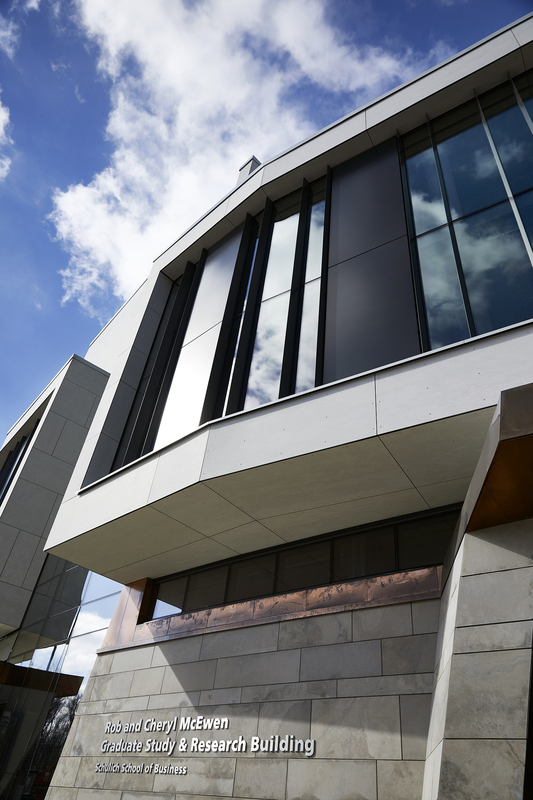 “It represents the leading edge of building design,” says James McKellar, an architect and Schulich professor of real estate and infrastructure who helped guide the five-year, $50-million project. Designed by Baird Sampson Neuert Architects, the three-storey, 67,000-square-foot structure utilizes extensive green roofs, a rainwater recapturing system, radiant floor heating and cooling, low-energy LED lighting, water-efficient fixtures and a solar chimney supporting natural ventilation. Sunshine pours in through large windows that open and retract automatically in response to the inside temperature. Bricks are made from recycled glass, the tile is local Algonquin limestone, and the native landscaping is both biodiverse and drought-tolerant. Canadian art lines the walls and at night LED lighting illuminates the 27-metre-high chimney, signalling a beacon of change. 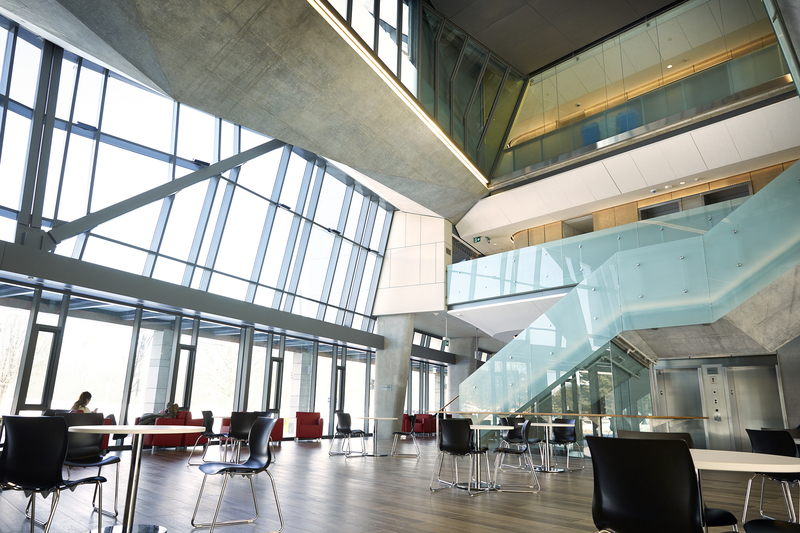 “The Mamdouh Shoukri Atrium is a major social hub as well as an energy-saving device, significantly reducing the building’s energy use intensity,” says chief architect Barry Sampson, a Fellow of the Royal Architectural Institute of Canada who collaborated with climate engineering firm Transsolar in achieving “an aggressive sustainable design agenda” at Schulich. 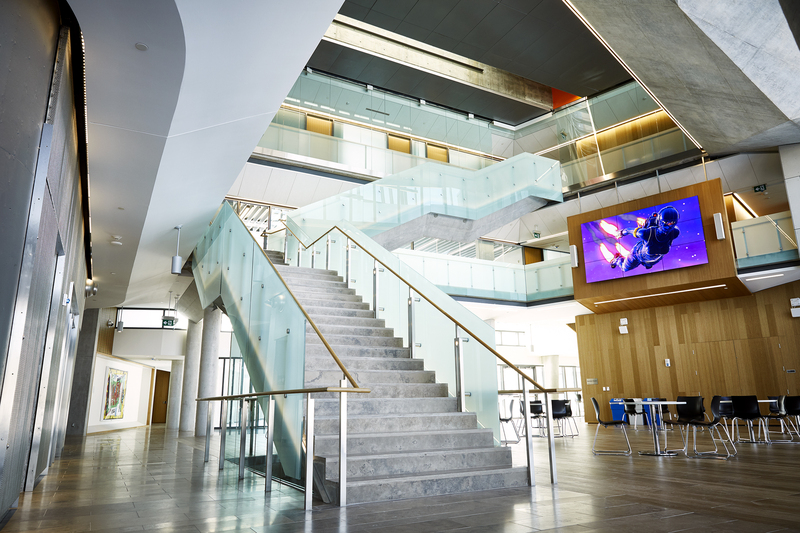 These sustainability-minded details and more have reduced energy use intensity of 71.4 per cent below the Model National Energy Code of Canada, making the McEwen Building a leader in eco-conscious and socially responsible architecture. 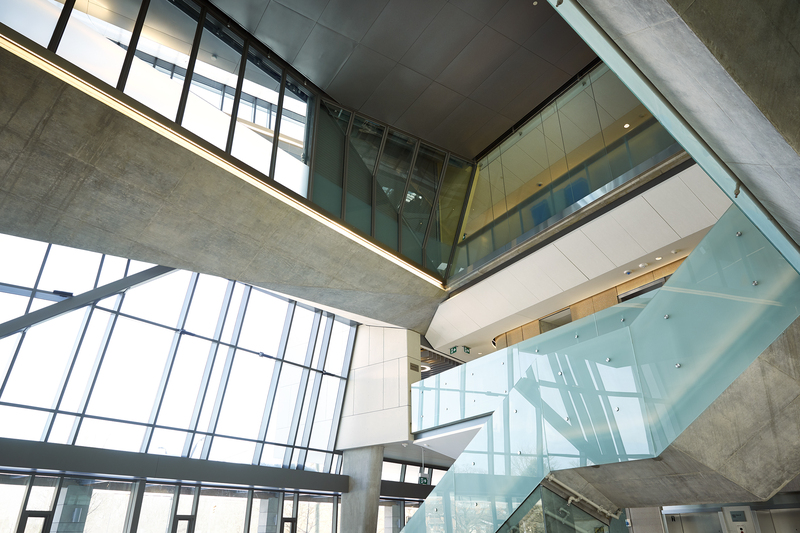 For award-winning Toronto architect Ian MacDonald, who was not involved in the McEwen Building but who recently asked for a tour after hearing word of the accomplishment, “It’s the kind of architectural ambition and vision that needs to be celebrated.